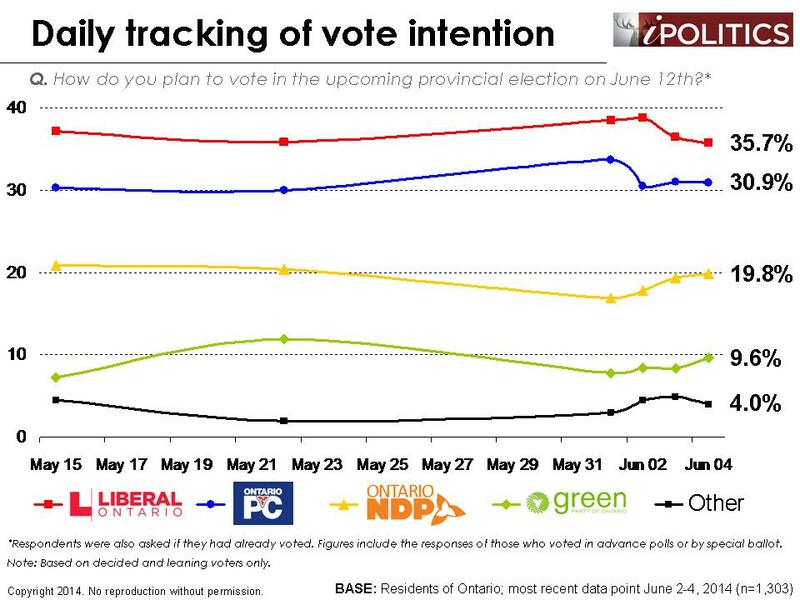 [Ottawa – June 5, 2014] – There is still a week to go in the campaign and the dynamics of turnout are very much uncertain. There are, however, some clear conclusions evident from charting the rhythms of the campaign and the situation post-debate. Barring some frankly unlikely shift in the campaign dynamics, Wynne appears to be on her way to victory, with an excellent shot at a majority. The only critical obstacle at this stage is turnout. Given the contradictory polling out there and the modest nature of the lead (five points), some might ask why would we would make such a bold claim. Here are our reasons. 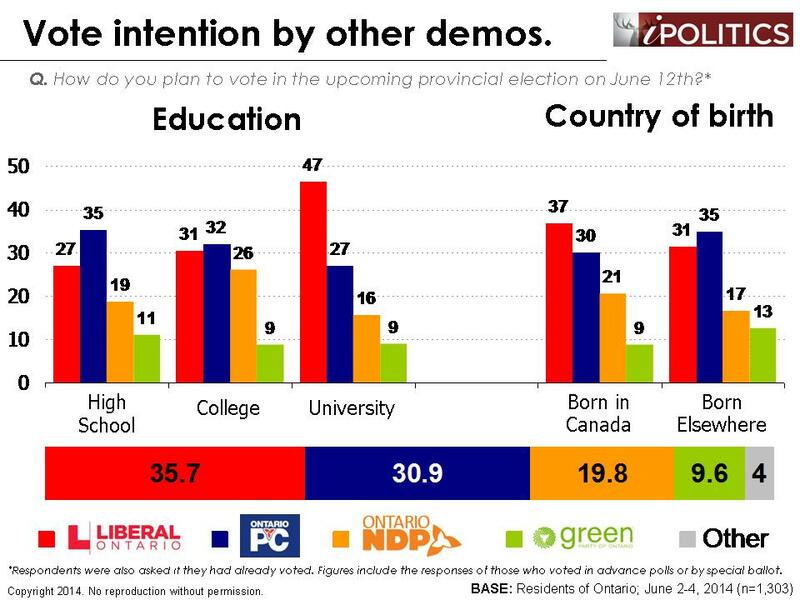 The Ontario Liberals have maintained a stubborn and significant lead of around five points with all eligible voters almost throughout the campaign. If this lead had suddenly appeared out of nowhere, or we had seen a mercurial electorate, we would be loath to predict victory on such a scant lead. In this case, however, the lead has been highly stable and doesn’t seem to be an artefact of chance. Reinforcing that point are demographic patterns. Two key points here: 1) her constituency has a very clear regional and demographic profile which has persisted throughout the campaign (e.g. 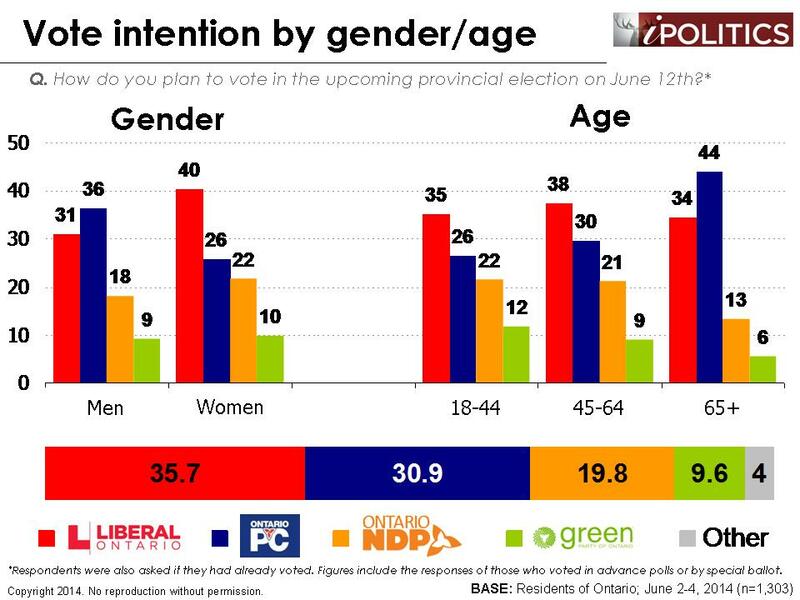 women, boomers, university educated, the GTA) and 2) none of these key constituencies are weak in terms of propensity to vote. We also note that she has maintained enough strong emotional engagement for her hopeful tenor to at least offset the anger of the Hudak constituency. Finally, while it appeared that her debate performance wasn’t stellar, it wasn’t terrible either. If it had been the latter it would have registered more strongly by now (and there was some evidence that it had a mild negative effect which has now dissipated). The race is now, and has been for some time, pretty locked in. There isn’t a lot left in the toolkit of the opposition parties to throw at the front runner. Having survived the debate and kept a modest but stable and good enough lead throughout a tough campaign, Ms. Wynne seems headed for victory. The only critical obstacle in her way now is turnout. While we have little insight on the get-out-the-vote machinery of the parties, we can offer an empirically informed approach to turnout based on – emotional engagement, past voting behaviour, knowledge of polling station, and demographics. 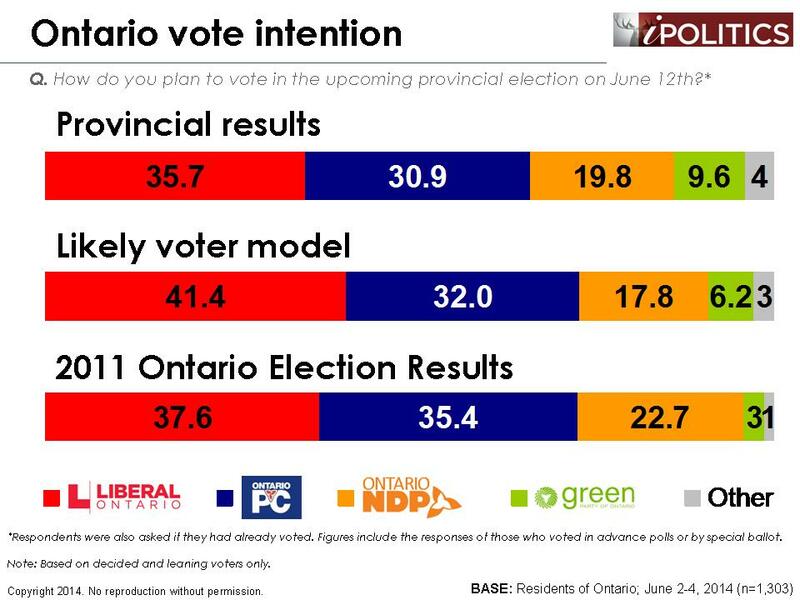 This model not only shows no disadvantage for Wynne, it actually broadens her lead from five to nine points. We realise that both our overall numbers and our new likely voter numbers fly in the face in some of our esteemed competitors and colleagues who have seen a different race than we have seen through our lenses. With all respect, we submit these tentative conclusions, which we are willing to alter in the face of new evidence. But barring some unlikely shift in the landscape we believe that Wynne and the Ontario Liberals are heading for victory and if we are asked to guess at what sort of government they would form, we would guess majority. Forecasting likely voters is a mug’s game as Frank Newport of Gallup has vividly experienced and we have had our own misfortunes on that front in missing the Conservative majority by virtue of a failure to predict turnout in 2011. We have learned from our mistakes but anyone who tells you they know for certain who will turnout is making it up. As Niels Bohr once noted, prediction is really hard, particularly about the future and any pollster who can accurately predict next day behaviour should turn in his pollster card and get into equity markets where a lot smarter bunch have yet to figure out next day behaviour. Nonetheless, in an era where as many don’t vote as vote, and where there are increasingly systematic differences between the voters and non-voters, we can’t ignore this challenge. Complicating it further are the get-out-the-vote efforts of the parties which can contain a blend of dark ops and more conventional measures. Pollsters really can’t measure these crucial contextual variables and empirical research suggests these efforts can have up to an eight-point impact on turnout for the different parties. Past voting behaviour. Our research shows that the best predictor of whether one will vote is past voting behaviour. Serial non-voters remain such and vice versa. Emotional engagement. This one is tricky and important (where Newport faltered). We give a half-point for those exhibiting strong emotions (anger, hope, happiness), while awarding none to the more tepid, discouraged voters. Intention. The obvious approach of asking people if they are going to vote (often recommended to us) has some pretty big flaws. The connection between self-stated intentions and behaviour is highly sketchy in the real world. Knowing where the polling station is. This is a useful but limited predictor. As Pew and others have found, if you don’t know where you are supposed to go to vote a few days before the election, you aren’t voting. We can’t figure out a proper score for being told an erroneous location and let’s hope there is none of that this time out. Finally, we tally the scores and identify the ~50 per cent of the population that is most likely to show up and vote on Election Day. In this case, we take all those respondents who score 4.5 or greater (out of a maximum possible score of 5.5). The field dates for this survey are June 2-4, 2014. In total, a random sample of 1,303 Ontario residents aged 18 and over responded to the survey (including a sub-sample of 1,067 decided voters). The margin of error associated with the total sample is +/-2.7 percentage points, 19 times out of 20. Where do I look for individual riding polls? Thank you. Unfortunately, we don’t offer results at the riding level for two reasons. First, we simply don’t have enough cases per riding to get any kind of meaningful analysis from the results (don’t forget, Ontario has 107 ridings!). Second, it’s not possible to geo-code cellphone numbers (we can determine their region, but not their exact riding). The results would therefore exclude all cellphone-only households (which make up about 20% of Canadian households). This would throw off the results, since we know from our extensive testing that Canadians who’ve cut their landlines are systematically different than other Canadians (particularly when it comes to vote intention).